As it marched its way through the Bahamas leaving destruction in its wake, it was more of a rain event here. There were three distinct bands of weather that came through. First the outer band came through right after I got back from the dog walk at 7AM. That was when I noticed that my windowsill had this particular visitor. I'm used to seeing Geckos and Lizards on the house, sometimes climbing the walls, sometimes climbing my leg outside when I'm gardening. In fact, they're so common and so frequently climbing people's calves when they're gardening that a gecko on a leg is a common tattoo around here. The second band came and stayed around Lunchtime. In fact, the first was the bow shock that precedes a storm, whether it is a hurricane or just a vigorous front, the second band was the storm itself. A few gusts and a lot of rain for a couple hours, we were lucky. It lasted so long that when I took my breaks, I'd let the dog come with me onto the porch and I'd stare at it like a chicken in a barnyard. While I remembered to keep my mouth closed so I didn't drown, I noticed that the house was covered in lizards and geckos. In fact there were an inordinate amount of the little things all over the porch. Each time I'd step out, I'd herd them away simply by my presence, and my dog would help them on since one of her favorite things in life is to do just that, chase geckos. They would return when I went back inside to my dry room, each in their own temporary territory, some on the window watching me, others on or behind the stones that are on the front porch. Later in the afternoon, the last band came through. It was that trailing bow shock that curved directly over the house. The cloud was so dramatic that just before the skies opened up for one last blast I had to come out to see. 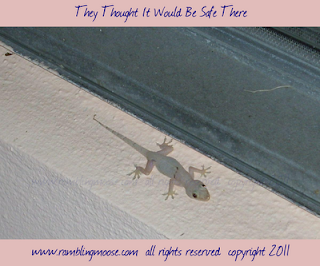 The lizards were still there, watching from my porch and waiting for me to go back in. Any port in a storm, even a porch will do.